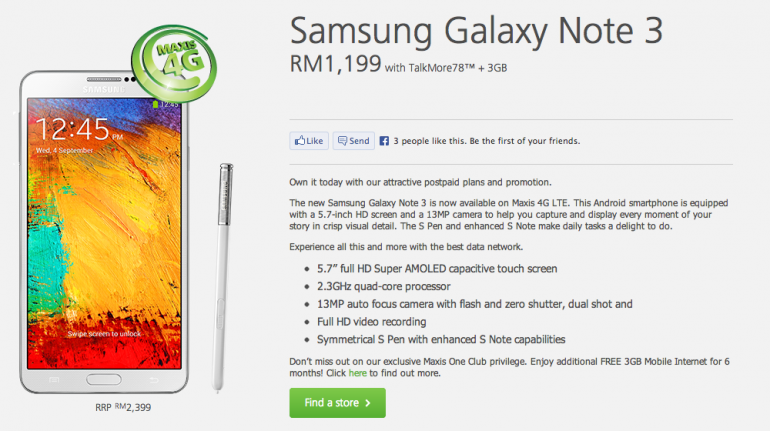 Finally, it looks like Maxis too has unveiled its Samsung Galaxy Note 3 phone bundle, just hours before the scheduled launch date of 25 September 2013. It seems to be a trend now to offer the Note 3 with only very few postpaid plans, Maxis is only offering it with three postpaid plans – SurfMore75 or TalkMore78 + 1GB or 3GB of data a month; all three are tied to a 24 months contract. It looks like Maxis has got a lot more to offer for the Samsung Galaxy Note 3 than the 3 bundles posted on their website, we’ve received information from Maxis (thanks Maxis!) that they are also offering the device with a 12- or 24-months contract under almost all of its postpaid plans including SurfMore50, SurfMore75, TalkMore78, TalkMore48, TalkMore28 and even its old Value First and Value Plus plans. Maxis will also be offering a free Samsung Galaxy Gear smartwatch with its most expensive bundle at RM146 a month, only for its Maxis One Club members. 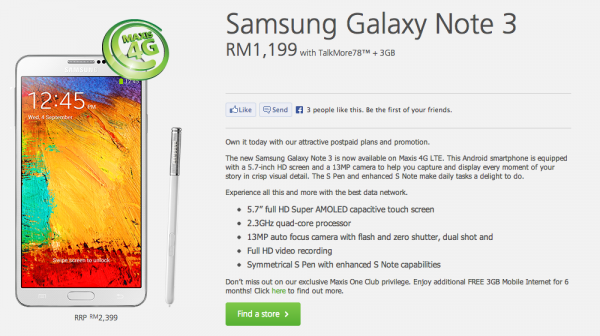 Maxis is also offering the Samsung Galaxy Note 3 with its other Value Plus plans together with a 1GB or 3GB data plan. Maxis will offer the Galaxy Note 3 for RM1,599 and RM1,499 respectively when customers sign up for a 24 months contract under a Value Plus plan + 1GB or 3GB data plan. Some of the plans do look pretty attractive actually, especially for the TalkMore28 bundle, if you’re a light mobile user. While Value First sounds interesting as well, it is one of the old postpaid plans from Maxis with a rather expensive call rate, I’d personally pick a newer postpaid plan that bundles free calls and SMS along with it. If you’re interested to sign up with one of these plans, do visit a Maxis Store. Meanwhile, hit the break for more information about Maxis’ Free Samsung Galaxy Gear bundle.